It is not coincidence that artists who picture what is below them often arise from the study of architecture. Common to both is an aerial imperative, an ineluctable desire to construct pattern in the landscape. Leonardo da Vinci, for example, was a renowned military architect before he painted his extraordinary aerial landscapes in 1502 from viewpoints imagined high above Italy. He was a genius of mechanical drawing, his axonometric views of buildings and towns were groundbreaking, and he drew floor plans for his paintings previous to executing them. The photographer David Maisel displayed a penchant for mechanical drawing in public schools, went to Princeton to study architecture, left to work at the international firm of Hardy Holtzman Pfieffer, then returned to school to earn a degree in art history. While there he also studied with photographers Edward Ranney and Emmet Gowin. Maisel’s early photographs of vines reveal his fascination with pattern in the landscape, a predilection only encouraged at Princeton. Working with Ranney increased his appreciation for the built form in the landscape, the older artist being one of the world’s foremost photographers of Mayan and Incan monuments, such as Machu Picchu. When Maisel flew over the ashen summit of Mount Saint Helens in 1983 with Gowin, it wasn’t so much the crater of the volcano that captured Maisel’s attention, as it was the effects of logging seen from the air, patterns of land usage otherwise invisible. When he returned to the East Coast from the flights over the newly ruined volcano, Maisel took with him a keen desire to photograph things not seen by other people, a difficult proposition from the ground. Fascinated equally by Timothy O’Sullivan’s work as an exploration photographer in the mid-nineteenth century and Robert Smithson’s studies of entropic landscapes, including industrial ruins, Maisel looked for relevant sites he could readily get to from New Jersey. He researched open pit mines through topographical maps and industry publications, hired a plane and pilot, and took off over the quarries and coal mines of western Pennsylvania. He flew throughout the mid-1980s to take black-and-white photographs of mines in Arizona and New Mexico, clear cuts of timber in Maine, and then, with the help of a National Endowment for the Arts fellowship in 1990, returned for more work over the West, where he began to work in color. Throughout the latter half of that decade he also served as an assistant to a well-known architectural photographer in New York City and spent a year in Harvard’s Graduate School of Design. But in 1993 he moved to the coast of Northern California to pursue photography full time. Architecture was for Maisel a discipline that tended to isolate him from the world, while photography placed him more firmly within it, the latter a stance he could nurture more easily while closer to the subject matter that interested him. Maisel considers his Black Maps project to have begun with the photographs of mines and clear-cuts that he made while still at Princeton, but widespread public awareness of this multi-chaptered epic of environmental devastation didn’t occur until he began working over the Owens Dry Lake in 2001 and the Great Salt Lake in 2003. His revelation of the stunning and toxic hues of both sites have become iconic views of them, despite the fact that these disturbingly vivid photographs deliberately eschew reference and narrative. They can be abstract in the extreme and run exactly counter to the intent of most aerial photography, which is to specify and identify pattern and activity in the landscape. To that end, the photographs from Terminal Mirage, work done over the shorelines and chemical works of the Great Salt Lake, and The Lake Project over Owens,bear no titles, only numbers. Meanders of poison, the rectilinear walls of evaporating ponds, tidal strands of blood-red halobacteria and pools of viridescent algae-it is surveillance of a depredation otherwise unavailable to us save from the air, but also nonrepresentational, a tension that forces us to look and look again. A secondary opposition arises in the photographs, which fall into that category of the industrial sublime also inhabited by Richard Misrach, most notably in his work on Bravo 20, an illegal bombing range in Nevada, and Edward Burtynsky’s studies of minescapes and toxic dumps. Although the methodologies and aesthetics of all three are quite distinct, they each provide us with images of a beauty we are horrified to admit that we have created. It is true that, if you want to understand politics, you follow the money. It is also true that water flows uphill toward money, as noted by Marc Reisner in his polemic on water politics, Cadillac Desert. If you want to understand the cities of the arid West, therefore, you follow the water. The Owens River, which collects the runoff from 120 miles of the eastern Sierra Nevada, used to flow southward to the base of the mountains north of Los Angeles. That watercourse was blocked millennia ago by a lava flow, and the water backed up into what was a newly landlocked basin, the Owens Lake. William Mulholland, the engineer who headed up the Los Angeles Department of Water and Power during the early twentieth century, made note of that fact as he was pondering how to capture a new source of water for the city. The Los Angeles Aqueduct completed under his direction in 1913 closely followed the prehistoric watercourse, and by 1928 the lake was completely drained, becoming the most prolific single-point source of particulate pollution in North America. Maisel calls his Oblivion chapter a coda to The Lake Project, the deliberate desiccation of the Owens Dry Lake a corollary in reverse to the once arid, but now well-watered, L.A. Basin. He literally followed the water to its destination to see how the ruined environment of Owens Dry Lake related to Los Angeles. What he found was a landscape ruled over by paranoia. Hovering over L.A. after 9/11 was not as easy proposition as it had been over the playa. It’s fine for the police and newspeople to do so, but for a photographer it’s a situation made much more tentative by new homeland security rules and regulations. He had learned from Gowin while working over the “red zone” of Mount Saint Helens how to be persistent with authorities, however, and he was granted permission to traverse the Los Angeles Basin from ten thousand to twelve thousand feet, which gave him sufficient altitude to make both vertical and oblique photographs of the territory below. When looking at the black-and-white negatives afterwards, Maisel realized that he preferred the way they looked without being printed in positive, remaining a less mediated object within the photographic process. The resulting prints are as ashen as the slopes of the ruined volcano; spooky, post-apocalyptic, complete objects in themselves without being reversed back into a normative view. And they hold your attention longer as your mind attempts to make sense out of them. We expect aerial photographs to function as maps, to bear a one-to-one correspondence with reality, and the dissonance between our expectations and what we see presents us with a puzzle we are compelled to address. You immediately recognize the forms and the organizational logic of a city-the geometry of the freeways, for example, or the cul-de-sacs of a housing development-but the circumstances are strange. How can those white bands next to the overpasses be snow in Los Angeles? Oh, wait . . . are those are the foliate tops of trees that would normally appear dark? Or oddly translucent shadows? Stepping back from the image, the vertical views taken from so high up reduce the city to the recursive density of an elaborate computer chip. In negative, the darkened rooftops recede visually below the lighter walls, hollowing out every structure into empty building blocks. The oblique views are even more distressing, as what is abstract is put abruptly into the context of a landscape. The circuitry of the city is suddenly linked to a shoreline, a range of hills. The skyscrapers of downtown are now axonometric figures in a virtual reality, as if displayed in a Computer Aided Design program, and the course of the Los Angeles River is indistinguishable from those of the freeways. The oblique view labeled Oblivion #1364 lays out a city as elaborate as that of a Persian carpet, yet it is as white as if it had been incinerated. What presumably is a blown-out, overexposed sky above the hills in the background is instead a black void that glowers over the city. It’s how an X-ray looks, how we imagine the military sees the monochromatic world when surveilling it at night. It’s as if we are seeing a what the artist refers to as a “shadowland,” a place previously unobserved that coexists with its sunstruckversion. The oldest surviving permanent photograph, made by the French inventor Joseph Nicéphore Niépce in 1826, is a picture he took out of an upper-story window of his country house in Burgundy. The process he used was heliography, which required hours of sunlight falling on a pewter plate to fix the image in particles of bitumen. To use a French word coined at roughly the same the time, it was a long “surveillance” over the rooftops, perhaps eight or more hours, and the resulting photograph was still underexposed. The low level of detail in the image lead you to feel as if you are viewing something inexplicably private, as if you were looking down into a space not meant to be spied upon. Picturing cities from the air was conducted in the imagination long before photographers were hanging out of aircraft. In fact, people have imaged cities from above for almost as long as towns have existed, their motives mixed, the results often a hybrid of map and art. A mural fragment from the late neolithic village of Catal Hoyuk, a trading settlement of 6,000 in Anatolia, traces a vertical view of streets and buildings as long ago as 6400 B.C. The mural has been called the world’s first map, the oldest landscape painting, and the first urban planning document, a conflation of objectives that still underlies many aerial photographs. “Bird’s-eye” paintings of cities such as Venice became common from the sixteenth century onwards, far before the invention of ballons, and by the eighteenth century were becoming as popular in America as Europe. In 1849, heeding the words of Arago, Colonel Aimé Laussedat of the French Army Corps of Engineers experimented, albeit unsuccessfully, with cameras suspended from kites and balloons. The first aerial photograph was taken from a balloon in 1858 by Gaspard Felix Tournachon, the artist also known as Nadar. Those photographs above the French town of Petit-Becetre no longer exist, and the oldest surviving aerial photo was taken from a balloon over Boston by S.A. King and J.W. Black in 1860. By then America already had a thriving business in bird’s-eye views of cities, and audiences accepted the aerial photographs as the newest innovation in that stream of images. 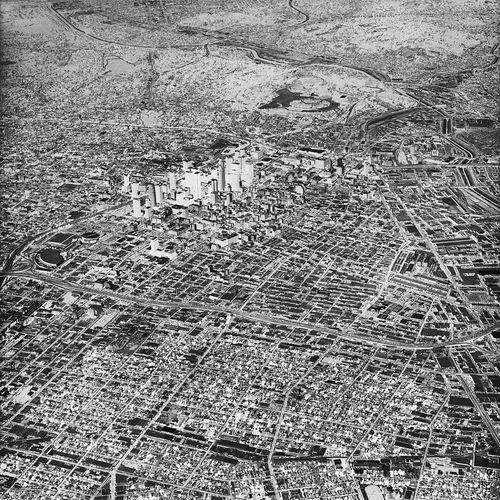 Nowhere else is the use of the aerial view more prominent than in Los Angeles, a city of four million people residing within 500 square miles, a civic subset of Los Angeles County, a geographical unit of 4,752 square miles with more than ten million residents. The metropolitan area covers such a large and topographically complex area-it is the only major city in the world divided by a mountain range-that it is always difficult, and in many cases impossible, to live and work in LA without a vehicle. When oil was discovered downtown in 1892, the total population of the country was around 100,000 people, who traveled over seventy-eight miles of streets. By 1915 Los Angeles had 55,000 vehicles, already making it the most auto-intensive city in America. Five years later the county’s population of 936,455 owned more than 600,000 autos. Today the county’s 21,253 miles of roads, streets and twenty-seven freeways serve 92 million miles of collective daily commute, a condition that shapes any aerial view of the city. By the 1920s The Los Angeles Times was using bird’s-eye views to explain the city to itself-including ones tracing the path of the aqueduct. During that same decade the Los Angeles Police Department (LAPD) realized that L.A. was too big to patrol by foot. Example: Sepulveda Boulevard, one of the main thoroughfares in west Los Angeles, is the longest street in the United States, running seventy-six miles from Long Beach north to the San Fernando Valley. What the police needed was fast transportation controlled by a command center, so they fielded radio patrol cars. The department went on to hire a fixed-wing pilot in 1931, then put the first helicopter over an American city in 1957 to patrol the freeways. Local television station KTLA, attempting to keep up with the action, put the first TV news helicopter in the air the following year. The police estimate that a helicopter can conduct surveillance over fifteen times more area than a patrol car, and they now operate seventeen of the aircraft; the fire department flies another five, and the Department of Water and Power, which runs four over the Los Angeles Aqueduct and other facilities. Since the 9/11 attacks, DWP flights have increased fourfold. The LAPD helicopters alone clock in more than 17,000 hours a year, at night illuminating crime scenes with 30-million-candle spotlights. In 2005 local law enforcement began to fly Unmanned Aerial Vehicles (UAVs) over public events, such as the Academy Awards. The craft can remain stationary over a site for hours and feed real-time, high-definition, encrypted aerial images to mobile command centers from thousands of feet higher, and with much greater stand-off distances, than the media cameras. The culture is awash in aerial images of Los Angeles made for any number of purposes, not least of which are the live helicopter telecasts of car chases. Nighttime aerial traverses over downtown have become a stereotypical opening for movies, a trope broadcast around the world. Such establishing sequences are made, of course, as much for aesthetic purposes as geographical ones, and aerial imagery in Los Angeles art has a distinguished lineage throughout the last century. Notable examples are Ed Ruscha and Peter Alexander, both of whom have used aerial photographs from helicopters as source material, and painted the illuminated city grid from above. What these artists have done with aerial views is subordinate them to symbolic ends. By painting the grid at night and abstracting it down to the level of an optical phenomenon, they allude to, yet deter us from reading the image as map, thus creating a more open field of metaphorical potential. Paradoxically, even though the photographs in Oblivion were made during daylight, they also fall within this traditional of nighttime aerial views of the city because we conflate day and night within them. In so doing, we feel as if we are penetrating the darkness and conducting surveillance, even though we are unable to read the images as maps. The term “shadowland” that Maisel uses when discussing the Oblivion photographs is appropriate. When you cast a shadow on a fact, you create doubt. When you shadow someone, you follow them invisibly. Shadowland is what the military calls those blacked-out areas where they wish to operate unseen, whether they are testing an experimental aircraft or interrogating people beyond lawful means. It is a land of spies and spooks, a place where ghosts live, and what Los Angeles looks like in Oblivion. The city is almost recognizable in Maisel’s negative prints and yet not quite, as if we are seeing both more of what we know and less. It is a disquieting effect, not least because, according to Jean Piaget, a child’s first conception of a shadow is that night is a black cloud and the source of shadows. The word “paranoia” crops up often in reaction to the Oblivion series, as if we see a shadow but can’t find what casts it, another confusion suffered by children as they try to understand the nature of shadows. We look at Maisel’s photographs and instinctively wonder what is casting the shadow. This exposes the essential, existential fear central to modernity: the anxiety of estrangement from the world. The aerial work by Maisel and his colleagues gains importance as the elevated photographic surveillance of the Earth, initiated by Niépce, becomes ubiquitous. Beyond the ground being photographed from helicopters and UAVs, we can now image most of the Earth down to street level from our home computers, and the aerial, instead of remaining exceptional, has become normative. Eventually we will have seamless coverage of a fully instrumented planet, and all that will save our aerial imagination may be the work of artists. Maisel, by optically deranging his subjects, from dry lakes to watered cities, makes us stop to reconsider both the terrain and the territory. By subverting a cartographic tradition, indeed, by turning it inside out, he constructs representations that are based on the same terrain as maps of the area, yet they forces us to reconsider what we think of as familiar territory, the place we have made where we live. The photographs of David Maisel are first and foremost rigorous formal objects, as carefully composed, even while on the fly, as an abstract painting. Photograph from the air long enough and you learn to anticipate and frame the view that will shortly come in range. Spontaneity and accident are there, as well, but the point is that these images are not reportage. They bring us news of the world, but not in a way that confirms what we think we know, but rather in a way that slows and changes our perception of it. We end up knowing a little more about the boundaries of what we don’t know, which is exactly that part of surveillance to which we must pay attention. Roberto Cassati, The Shadow Club. NY: Alfred A. Knopf, 2003. Davis, Mike. City of Quartz: Excavating the Future in Los Angeles. London:Verso, 1990. Peter Alexander: In This Light. Newport Beach, CA: Orange County Museum of Art, 1999. Essays by Dave Hickey and Naomi Vine. Marshall, Richard D. Ed Ruscha. London: Phaidon Press, 2003. Reisner, Marc. Cadillac Desert: The American West and its Disappearing Water. New York: Penguin, 1993 (revised edition). The online journal Archinect posted an extensive and well-illustrated interview with the artist on May 20, 2006: http://archinect.com/features/article.php?id=35223_0_23_0_C. The artist also has his own excellent website: http://www.davidmaisel.com/.